Jac Nasser said the company understands how important this issue is to JATAM. The Board have been consistent in their responses and actions in recent years. They will not sanction a major project in Kalimantan this year. They have progressed a small project involving road works, loading facilities and employee accommodation for a small mine. This is what they had said they would do. But they are not approaching this any differently from any other project in any other country. Any changes in what they are doing or thinking of doing will be discussed in the usual way. They had invited Andrew Hickman to visit them in Kalimantan and would welcome dialogue after the meeting. Jac Nasser thanked Jazmin for coming to share her views. He said he knew she cared deeply about the issues and the company respected that. The company does care about her. They do talk about financial results but also about general social, economic, environmental and community issues as well. He said that he appreciated her coming to the meeting. He recognized that Cerrejon is in a very difficult social and political environment. He offered to meet Jazmin after the AGM. Cerrejon had been on the agenda for many years. He proposed to respond to her question fully outside the AGM. Jazmin said that she was looking for a public response in the meeting. The company was on her people’s land. Jac Nasser said that he understood this, but that the company needed to consider its response. Andy Whitmore of Indigenous Peoples Links noted that the International Council on Mining and Minerals had issued a new position statement on Free Prior Informed Consent (FPIC), and that BHP Billiton was working to get FPIC for major new projects and major changes to exisiting projects from May 2015. This was an improvement over its current policy. Would the Chair comment? Jac Nasser said that he welcomed continued dialogue over this matter. The company was updating its internal documents to reflect the latest position of the ICMM. He asked Andy Whitmore to meet the company’s Vice President for Community Relations and Sustainability, Ian Wood, after the meeting. Richard Solly, of London Mining Network, asked what the company thought about the Papua New Guinea government’s nationalization of the Ok Tedi mine and the attempt to take over the long-term fund for affected landholders around the mine. He also asked what were the implications of the removal of legal impunity from the company. Jac Nasser replied that BHP Billiton had decided to pull out of Ok Tedi in 2002. It was done because of worries about future environmental issues. He said it was a good example of where the company lived up to its charter. BHP Billiton would have preferred to close the mine earlier. The government did not want to do so for economic reasons. The company gave its share (52%) to PNG SDP, a not for profit independent company. It aims to return money back to the people and specifically in Western Province. It was a very good thing to do. PNG SDP is chaired by a former Prime Minister of PNG. It has accrued about $2 billion. About $600 million has already been committed to Western Province and the rest for future generations. BHP Billiton wants its shareholders to realise it has no ongoing ownership in Ok Tedi or in PNG SDP. The company thinks the legal position is very clear. The board was aware of what had happened in the last 24 hours. Jac Nasser said that Richard knew as much as the board did about the recent announcements. Overall the company’s position is very clear and has been clear for the last decade. The company finds it a little disappointing what the government is trying to do. Andrew MacKenzie added that what government is trying to do is to take a fund that BHP Billiton helped set up. It was set up partly to benefit the people around the mine, and the government seems to want to confiscate it for other, national reasons, and that is political interference. It is something the company thought might happen. That is why at the time of exiting BHP Billiton set the new company up in Singapore. BHP Billiton has taken legal advice that the fund is secure. That also underpins those liabilities as BHP Billiton settled all that at the time. The company has received legal advice that it is highly unlikely there will be any new liabilities. “In the context of the international political agreement to limit global warming to two degrees, there has been increasing public discussion about the concept of ‘unburnable carbon reserves’ if the world is to meet this target. Indeed, there is growing scientific and policy consensus that up to 80% of known fossil fuel reserves are effectively “unburnable”. “I have a straightforward yes/no question which I would then like to follow up with a short supplementary question. Jac Nasser replied that nobody could give yes or no answers. BHP Billiton agrees that mainstream science is right and that global carbon emissions need to decrease. This had been a key priority for the company for twenty years. The company’s annual reports include information on the potential risks of climate change to the company’s operations. The company has taken a lead in this matter. It has invested $430 million in emissions reduction since 2007. The company’s target was to reduce greenhouse gas intensity by 6% between 2007 and 2012 and it in fact reduced it by 16%. It aims to hold its absolute emissions below their 2006 level. It has engaged constructively in public debate. In 1996 BHP Billiton started talking about reducing its greenhouse gas emissions and has reported on performance every year. In 2010 it publicly stated its support for a price on carbon. It did so while a member of organizations that had not reached this view at the time. BHPBilliton is accountable for its emissions and it states what it believes to be right in the long term – but it cannot decide the energy requirements of the world: this is up to communities and governments. What is needed are policies that are fair, good for the planet and take into account the need to raise living standards. Andrew Mackenzie said that the company had looked at the concept of unburnable carbon to understand its impacts on the company’s portfolio, and the board will adjust the portfolio accordingly. Carbon pricing is important. The company can move its portfolio around and still deliver strong results for shareholders. Andrew Mackenzie replied that half that exploration sum was not related to energy. Much of it is related to copper, which will be required in greater quantity for renewable energy. Jac Nasser said he would deal with the issue of Ian Dunlop’s nomination later. He said that some aspects of the company’s portfolio would benefit from unburnable carbon and overall the board does not think that the company will suffer financially because of it. The board will keep it under review. It is a matter of intense review and analysis by the company. A representative of CCLA Investment Management said that CCLA is keen to support extractives companies going through the transition to low carbon. 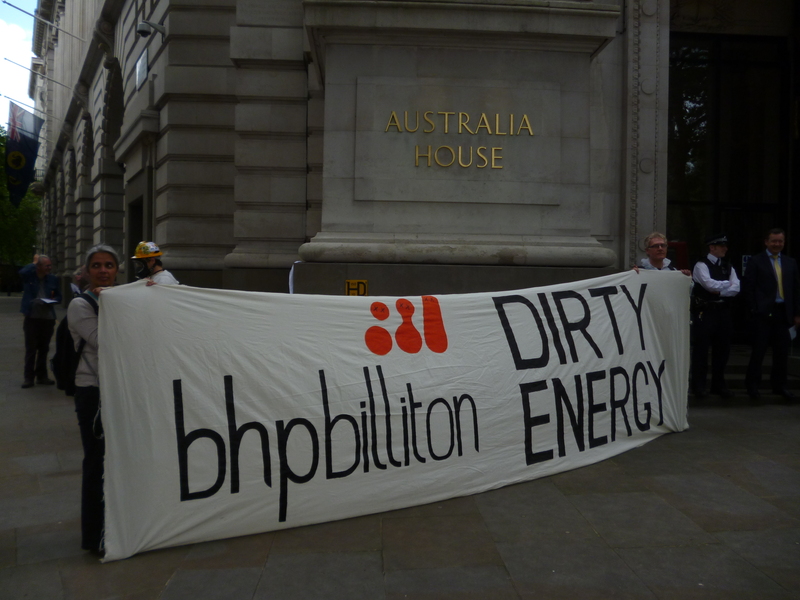 CCLA welcomes what BHP Billiton is doing to investigate unburnable carbon. But according to the Carbon Disclosure Project, BHP Billiton’s performance has declined against other companies, from a B rating to a C. Would the company improve? Jac Nasser said that the company was very disappointed at the change in rating, which is at odds with the improvements that the company believes it has made. It takes this matter very seriously and will work with CCLA to improve its standing again. Later on, Ian Dunlop presented his case for election to the Board. He said: “Chairman, Directors, Ladies and Gentlemen, thank you for the opportunity to speak in support of my election. My platform is focused on climate change, and I would like to acknowledge at the outset that BHP Billiton is more advanced than most companies in acting to address it, as the Chairman has indicated. However, I believe that action now has to be taken to a far higher, strategic, level. “The future prosperity of BHP Billiton is of great importance, both in Australia and globally. In that regard, I would like to make two key points: First, climate change poses a major strategic risk to that prosperity, and to shareholder value – that is a risk which has the ability to fundamentally alter the direction of the Company, or indeed to destroy it. Second, in my view the Board is ill-equipped to deal with this unprecedented challenge. “The latest science confirms that fossil-fuel emissions from human activity are warming the planet at an accelerating rate, and that both the extent and speed of that warming have been badly underestimated. “Current climate policies are leading to a world with average temperature increase in excess of 4oC – a world where population would fall from the current 7 billion to below 1 billion. Business in such a world is not possible. “These impacts are being locked-in by our investment decisions and inaction today, whilst the full, catastrophic, effect will not be seen for some time. “Dangerous climate change is already happening. To have a reasonable chance of staying below the “official” 2oC limit, we have virtually no carbon budget left, not even the 20% of global proven fossil-fuel reserves frequently quoted. To avoid catastrophic outcomes we must take emergency action now to halt new fossil-fuel investment, and rapidly wean ourselves off established fossil-fuel use. “But climate change also brings opportunities to achieve the sustainable future to which the Company aspires – provided we change direction in time. Otherwise, the bursting of the global “carbon bubble” will result in the substantial write-down of fossil-fuel assets, destruction of shareholder value and impairment of the Company’s ability to prosper in a carbon-constrained world. “The Company has comprehensive risk management and corporate governance policies, but I in my view, they are not being applied strategically to climate change. The Board itself has impressive skills and wide experience. But, in common with the boards of most major global corporations, it has fallen into the trap of “groupthink” in failing to grasp the enormity of the challenge that climate change poses to the business. “The Chairman’s characterization of my nomination as that of a “single-issue” director demonstrates the point. The very fact that the Board see it that way indicates that directors do not understand that climate change from now on will permeate every aspect of the Company’s activities, from broad strategy to operational detail. It is certainly not a single issue in any conventional sense, any more than I would be a single issue director. “Chairman, you suggested that the Company, on this issue, has to work within the policy confines set out by governments. But it is clear from experience over the last twenty years that governments are never going to show real leadership on climate change. We have now reached the point where business, in its own self-interest, must take the initiative and lead. “I have industry and governance experience comparable to current directors. In addition, I have the strategic perspective and knowledge to overcome climate change “groupthink”, fill a deficiency in the Board’s current skillset, and complement existing directors in guiding the Company’s response to these critical issues. “Ladies and gentlemen, the Board has recommended against my appointment. So in appealing directly to you for shareholder support, I re-iterate my two key points: First, climate change now represents a major strategic risk to the Company, and to your shareholder value – a risk which is not being recognized. Second, that the Board is ill-equipped to deal with this challenge. “I am inclined to agree with Mr. Dunlop that climate change poses a material risk to BHP Billiton and that the current BHP Billiton Board is ill equipped to deal with both the challenge and opportunity that this risk presents. The fact that the Board’s response to Mr. Dunlop’s nomination was to dismiss climate change as a single issue seems to indicate that you have failed to grasp the structural and systemic nature of climate change risk as it effects the entire operating environment of the company. “Firstly, what mechanisms have you put into Director and Senior Executive remuneration policies to ensure climate change risks are managed appropriately? Jac Nasser replied that there are performance indicators in the Executive Director’s remuneration package linked to climate change, but no specifics were mentioned about what these indicators were. With regard to the board, Jac Nasser explained that the board was conscious of speaking to a range of experts on a range of topics to ensure that they were getting a broad perspective. When Janny asked for specifics on this point he directed her to the policies regarding choosing board members which could be found in the BHP Billiton annual report.